Introduce yourself to private Pilates at Tone by trying the Introductory Private Session to be scheduled at your time availability. During your first 55 minute private session, you and your teacher will discuss your goals and individual needs while getting a hands-on demonstration of Pilates using some combination of the Pilates reformer, trapeze table, chairs, ladder barrels, springboards and small apparatus. Private Sessions – continue the one-on-one teacher/client sessions working on the Pilates reformer, trapeze table, chairs, ladder barrels and small apparatus. Semi-Private Sessions – this is when two clients of the same level are paired together to work with one teacher. 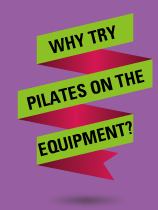 Equipment Groups (Pilates only) – Equipment groups consist of 3 or 4 people working with 1 teacher on the Pilates reformer, trapeze tables, chairs, mats and springboards. Join our Beginning Equipment Group on Saturdays or take an Introductory Private Session. Your teacher will guide you when you are ready to move into All Level Equipment Groups. Classes – Mat, cylinder, ball, stretch and all yoga classes are the perfect adjunct to sessions. Click here to book your classes. To discover the depth of your Pilates practice, we recommend doing Pilates 2 – 3 times a week whether this is all private or all group classes or a mix of both is up to you. To discover the depth of your yoga practice, we recommend creating a daily practice developed with a teacher and checking in with a 55 minute session at least once a month. The fact is the equipment helps to deepen your practice of Pilates. It’s really “the next step” as far as understanding and exploring the work. Here’s some questions you might have and answers you might find helpful. What does one-on-one give you? Individual workouts on the Pilates equipment are special; they are targeted to your needs and your goals. You may be surprised to find how many subtle alignment shifts and changes you can achieve with all eyes on you! The amazing thing about Pilates on the equipment is that there is always the next step…an ever available library of unique exercises teamed with Tone’s extremely knowledgeable equipment staff equals one feel-good, goal directed, made-for-you workout. Joseph Pilates developed the equipment to support the mat work, to help one learn to advance or to support the body when needed – experience this world of feedback, alignment and deepen your Pilates practice. Why should I pay more when Tone’s classes rock? Classes are fantastic at Tone and as amazing as our teachers are, there is no way for one set of eyes to see everything happening in everyone’s body. Imagine having that one set of eyes (and talented brain behind it) all for yourself for one hour. You can ask about that thing specific to your body and your practice. Savor the support of the equipment and reap the benefits. Is there a certain population for whom equipment work is really necessary? The equipment is for everyone, but can be a huge source of support during times of change in your body whether you want to increase your workout level or add some assistance. What about just checking in with a teacher once a month? Is there a reason for that? Checking in with a teacher privately once a month is truly a gift to your body. Thank it for what it does and give it a tune up in between your regular weekly classes. Your instructor can give you deeper elements to focus on that month during class, she can offer tips to help you achieve a more advance exercise or instruct you to better take care of whatever is happening in your body. We all do our best to listen to our bodies, but an outside eye can be a powerful tool to help us connect even more.